Here are the nine calendars I scooped up. My favorite? Row 3, Calendar 3! Morro Bay, CA – This is an update on the humongous, incredible envelope of junk mail I got from Boys Town. All the goodies in that envelope, you may remember, had a Christmas / New Year’s theme. Those goodies included several calendars, all big, all glossy, all beautiful, all very practical. Who’d toss them out? I don’t have any statistics but I’d guess darn few. Boys Town sent me several. All different designs. I believe they send everybody several. Why so many? Well, maybe some people would put one up in the kitchen, another in the study, maybe another by the washing machine, you know, to keep track of how often they do a wash. Maybe one by the scale to record their weight every Saturday, maybe one in the car to record grease jobs, tire rotations, weekly mileage, so many things. 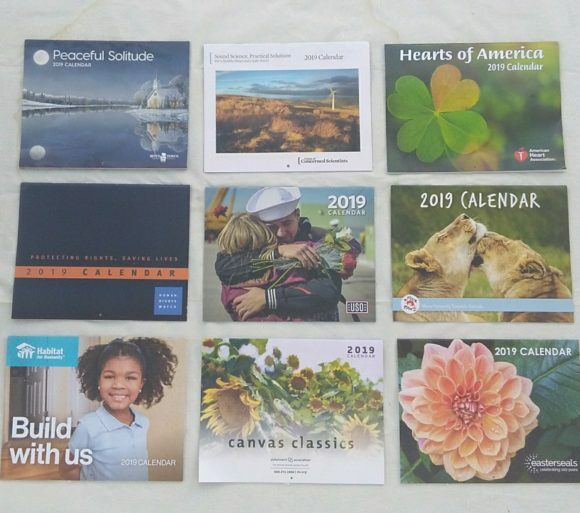 Truly I’ve been amazed to see how many other charities and philanthropies and non-profits have been mailing out calendars. All with a Christmas / New Year’s theme. I said “amazed” because it is amazing. There’s a flood of them. I had no idea. And all these outfits are asking for something back. Usually a cash gift, of course. If nothing else, to make themselves known and to make a good impression. It’s obvious to me now why such calendars have become such a prime, hi-payback fund-raising tool. Because people keep them, use them a lot, often daily, and the calendars look good on the wall. They use them to see if it’s a nephew’s birthday or someone’s anniversary or the time to make an appointment or pay a bill or to receive somebody’s rent or get their eyes examined or change the oil in the car, or to jot down something, on and on. And every time they look at the calendar, every time they jot something on it, they are reminded of that outfit. The outfit’s name is pounded into their memory every time. Yes, every time. Psychologists would call it a subtle, subliminal thing, I think. The outfits love that. I’m not sure, but I have the feeling all these calendars are being produced by the same company, though I don’t find a name anywhere. Think of producing all those calendars just for New Year’s! They must start printing them in January. Here’s how I became aware of this plethora of New Year’s calendars. Our Senior Center is wonderful in all the services it provides. Here’s one small example. In the lobby there’s a big display of nice greeting cards, for all occasions. Only 10 cents. Imagine that. Here’s another. There’s a big glass showcase. It displays a gorgeous assortment of one-of-a kind scarves and caps and doilies and even booties or baby blankets. All knitted or crocheted by enthusiastic lady members. All offered at prices so cheap what they get doesn’t even pay for the yarn. And with every penny going to the Senior Center! Here’s a third. There’s also a box with a tempting sign on it. It says “Take It If You Want It!” There are a lot of lookers. Well, on Tuesday I took a look… and among other things I found a lot of 2019 Calendars. More than a dozen. All dropped in by people who didn’t need them but didn’t want them wasted – you know, too nice to toss out. I scooped them up, curious about this whole calendar / fund-raising business. So who was mailing them out? Well, here’s the list.. Boys Town, of course. Concerned Scientists. The American Heart Association. Human Rights Watch. USO. Four Paws. Habitat for Humanity. Alzheimer’s Association. Easter Seals. These were the major ones. I took them home. And I decided to take a photo of the major ones because that way you’d get a better idea. And of course each “sender” is doing its best to send out the most beautiful, enticing calendar possible. They want people to keep them! Want people to trash any received from competitors! But not theirs! A lot of people receive calendars. All as junk mail, meaning not solicited. maybe somebody else would like them. In fact, in the box I saw three copies of a calendar from one outfit, and two from another. I go to the Senior Center every Tuesday and Friday. That was Tuesday. Today I took another look in the box. And saw even more calendars than the first time. Some published by outfits I hadn’t seen before. I didn’t bother to take any of those home. I’d find it interesting to know how many people are finding calendars in their mailbox. Must be thousands and thousand. Junk mail to some. But nice-enough-to keep junk mail to others. Have you received a calendar? Maybe two? What has been your reaction? I’d love to hear. Wish I knew how much money these outfits are raking in from these calendars. Must be a huge take. There are a lot of generous folks out there. Of one thing I’m sure. Whoever first got the idea of using calendars as a dandy fund-raiser made the Hall of Fame in the American Fund-Raisers Association. A genius was he. Or she. Oh, must confess I made up that association. It’s a fiction. But I’ll bet such an association does exist. Me? I’m keeping only one. The Four Paws calendar. Only because every page in it shows a big photo of a gorgeous animal. All exotic animals. Photographed by top photographers. You know, National Geographic-league photographers. A calendar just too nice to trash. I’m keeping it by my easy chair. I’ve always loved animals. But Four Paws was the only outfit in the nine I knew nothing about. Zero. Now I’m terribly embarrassed. I didn’t know what kind of non-profit Four Paws is. I just Googled it. Well, it’s not a non-profit. It’s a for-profit company! I blushed when I spotted that. It sells things like Four Paws Wee-Wee Puppy Pads and Four Paws Dog Cologne and so on. Wow! But then I discovered there’s a different Four Paws, thank goodness. It’s Four Paws International! Which has the very same logo. Which is soo confusing. Well, methinks it’s a spin-off — a non-profit foundation. And it has a single goal, it says. A noble goal: “to help animals who have been abused for entertainment, economic, scientific or other reasons … and we advocate and champion for such animals.” It develops this noble theme at great length. Even President Trump wouldn’t tweet anything wrong about that. Well, except if the Democrats jumped on the Four Paws Foundation bandwagon first. Then he’d tweet something awful, for sure. Anyway, it’s a beautiful theme which makes me feel a lot, lot better even though, like all the other non-profits, it solicits $$$ from us to carry on this good work. Anyway, I still like its calendar. Truth is, I have to acknowledge something else. Sure, I use a calendar an awful lot. For a great many of the things I mentioned above. But I do it all with my smart phone. Not only does my phone have an excellent calendar. It even notifies me of an appointment two days ahead of time, say. And reminds me of some repeating things from month to month, and even carries birthdays and anniversaries over from one year to another. You may have one. And that may nix your need for a paper calendar. I hope Boys Town and Alzheimer’s and Habitat for Humanity and the others are not heart-broken to hear that. They’re all good outfits. My opinion. If they found out I have a smart phone, they’d start sending me weekly emails, I bet. I’m going to keep mum. I’ll definitely bet I’ll be on Boys Town’s list for its 2020 calendar. I sent them a check. Just a token amount. But that makes it a sure thing. box at the Senior Center on Tuesday. Maybe others will scoop them up. Hope I get the Four Paws calendar next year. But I don’t have a puppy, so I’m not in the market for wee-wee pads. And I’m not planning to send Four Paws International a check. So that’s that, I suppose. But hey, maybe I’ll be lucky and find their 2020 calendar in that Take It If You Like It Box! With photos of different animals. Especially gorillas. I love mugshots of great big laughing gorillas. Hope you like my photo….